The Reverend Young is best remembered as Jamie Goose in Robert Burns’ poem “The Kirk’s Alarm” (1789), which poked fun at a number of ministers in Ayrshire, that he believed were still set in their old Calvinist ways. 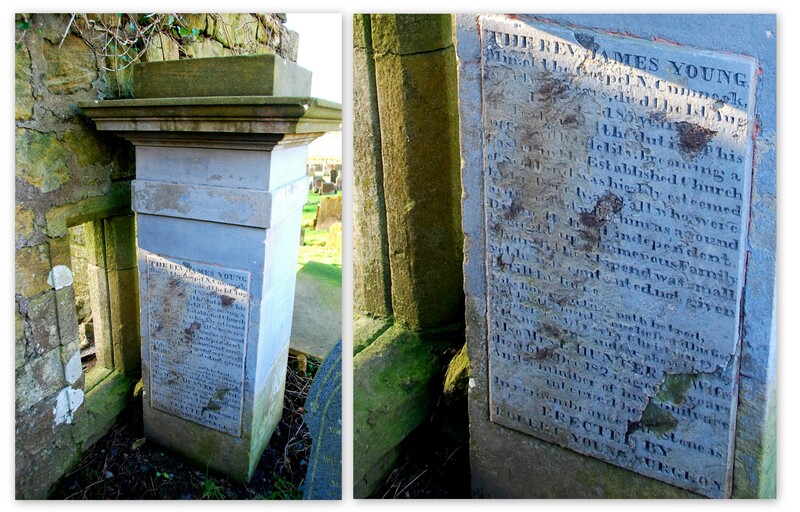 James, born 13th Oct. 1763 ; Robert, born 12th and died 30th Nov. 1764; Marjory, born 12th Aug. 1766 ; Marion (twin), born 12th Aug. 1766, died 8th Sept. 1780; Robert, born 20th Jan. 1768; Janet, born 20th March 1769 ; Elizabeth, born 5th Nov. 1770; Margaret Crawford, born 21st Feb. 1773 ; Alexander, born 5th March 1774 ; Elizabeth Penelope, born 21st Sept. 1775,died 18th Oct. 1781 ; Katherine, born 3rd Nov. 1776, died 30th May 1796; Mary, born 28th Feb. 1778; Patrick, born 6th June 1779. Publication Account of the Parish (Sinclair s Stat. Ace. vi. ).